When you see a box of chocolates, does your mouth start to water? Do you crave opening the box? Do you imagine biting the chocolate, tasting the sweet cherry mixed with the bitterness of dark chocolate? Or are you anticipating a rich nuttiness? Divine vanilla? Your blog post titles should be like that box of chocolates. When your headlines are lip-smackingly good, readers crave reading your post. You get more readers, more tweets, more likes, and more plusses. Check out the slide deck below with 5 tasty title templates you can swipe for your next blog post. You could write one headline, and consider your job done. But is your first headline the best? Will it draw serious crowds to your blog post? The first headline you write is your warming-up exercise. Keep going. Write ten, twelve, thirty headlines. Play with different templates. Have fun with different words. Make readers crave reading your blog posts. Make their mouths water. Make them lick their lips. Henneke – Since I signed up to your list, I’m always looking out for your Tuesday morning post, I mean delectable bites. Honestly, your slides are the only ones that I read through, hoping that they never end. Each one brings more and more copy writing goodness. Thank you. I’m with Veronique on the “79 warning signs your husband is cheating.” If the husband is leaving 79 hints he’s a loser anyway. Dump the dullard. Really enjoyed the slide show. And the addition of your drawings is charming. Hope you grabbed a chocolate? The SlideShare format really suits me. Thanks for the great headline templates Henneke! Creating headlines seems to be the hardest part of creating posts for me. Also like your use of SlideShare and the visuals to get the point across. Yes, headline writing is hard, and takes up a lot of time. I often write a working title before I start my blog post, but then I keep playing until I find a headline I’m happy with. And when I’m stuck, I take a sheet of paper and start scribbling, as that often works better for me. Writing more headlines really helps. I really struggle with headlines, so thank you for this. One question—what’s your take on length? I’ve started using the Yoast SEO plugin and it often tells me my post titles are too long to fit into Googles fix width box. I tend to just ignore it and write the best title I can. What’s your take on this? PS: Inspired by your gorgeous slide shows am going to try Slideshare this week. PPS: Love the pink. And also how you layer in pages. And your drawings! I try to ensure that the key message is in the first 55 words as the headline is often cut off after that (but my full headline might be longer). Let me know how you get on with SlideShare? Thanks Henneke. Thought that must be the case as people frequently use long headlines. I’ll check out that article and keep you posted re Slideshare. Because my content isn’t business related, my expectations are low. But who knows! I don’t keep a close eye on it, but I do see some self-development and spiritual presentations passing by now and then, so you never know! It’s worth a try – especially if you enjoy making something like this (I secretly make these SlideShares not for my readers, but because I enjoy making them myself :D). Henneke, I love these headline templates. Very original! Did you use PowerPoint or Keynote for the slideshare? Or something else? I’m trying to decide if I want to do a deeper dive into Adobe Creative down the road a bit. Thanks for the templates, and the instruction! I use PowerPoint, and then save the slides as a PDF before uploading the slides to SlideShare – this ensures the fonts all look fine (I don’t use the standard Microsoft fonts, but imported the Google web font I use on my site into Microsoft Office). One day I’d love to learn more… perhaps even animation. Thank you for stopping by again, Melissa. Always good to see you. Fabulous post and a totally brilliant slide share. Not only are the tips great ones but the presentation is wonderful .Thanks so much. I love getting your posts! Thank you so much, A.K. Love this, Henneke! Like David Ogilvy used to say, after you’ve written your headline, you’ve spent 80 cents of your advertising dollar. Yep, that’s absolutely true. And the weird thing is that often the best headline pops into my mind, when I’m doing something completely different. Does that happen to you, too? Creativity is weird, isn’t it? I’m happy to be a new regular here. Thanks for all the great content! You are simply awesome. Really you are. This post had my mouth watering as well as the examples you provided in the presentation. That was awesome and it made me realize that as much time as I spend working on my headlines, I may either need to spend more time on them to make them benefits driven and solving a problem. I usually choose one after 10 headlines, but I think I could probably do more and get more creative with it. Thanks for this post. I’m going to be referring to it, I’m sure, anytime I write a headline now. One of the best resources I’ve found … ever. P.S. I also really like your slideshare presentation and how you incorporate it into your post. Would you mind if I did something like that for one of my future posts … probably next year? Sometimes I stop at 10 headlines, but quite often I write 20 or more. Websites like Upworthy consistently write 25 headlines for each post (and then they test 3 or 4 to find the best one). And yep, you’re welcome to do something similar and include a slideshare in your post. If you like you could even embed my SlideShare in one of your posts. You can grab the embed code on SlideShare (here: http://www.slideshare.net/HennekeDuistermaat/the-godiva-guide-to-mouthwatering-blog-post-titles). You totally nailed the SlideShare in your post. I’m uber visual. So mixing up written content with the SlideShare was like an invitation to tea. It gave me a sense of relief and succinct comfort. Thanks for daring to experiment. And your post was as delightful — and oh so valuable (Evernote here it comes)! Thank you Henneke!! I used your advice on the very day you posted it. Love it! Glad you found it useful, Kelly! 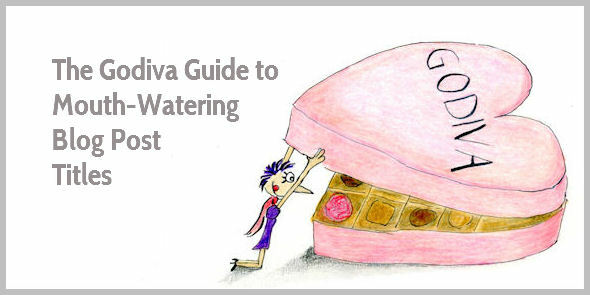 Quick question here: do you worry about copywrite laws or infringement when using words like ‘Godiva’ in your blog post titles? When does that become an issue? Hopefully not ever…@! Sorry, I somehow missed your question last month. I don’t think it’s an issue. I see plenty of posts with similar headlines. I’m imagining that as long as you don’t use it as a smear campaign, there’s little reason for Godiva (or another brand) to sue. But I’m not a lawyer, so I can’t give legal advice. I love the intro and closing of this post, but the slides seem to not be working. No matter where I click, nothing happens to scroll through. Would love to know when it’s working again. On another, I love all your post and so appreciate your great tips. They’ve been, and continue to be, so helpful! I’m so sorry the slides aren’t working for you. Thank you for letting me know. Please let me know so I can try to figure out what’s going wrong.